Because most churches don’t. Because I’ve sat through too many services where my life and identity is either ignored or talked about badly. If your website says nothing about transgender people I will automatically assume that you are not welcoming of transgender people. But don’t lie. If your church needs to do work on transgender issues, you need to do that work on your own without having a transgender person be your guinea pig. Please, don’t overstate your welcome if you’re not ready to actually be welcoming. These are the ones that come to mind for me. What about you? What do you look for on church websites? What has your church done? Have you had really bad experiences at churches? Or really good ones? Share away in the comments. Want to make sure your church is doing safety and inclusion right? 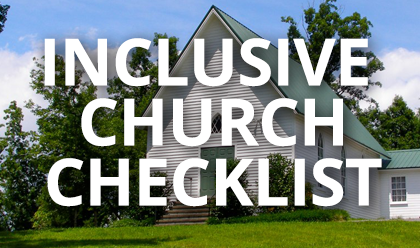 We put together a 2-page checklist so you can make sure your church is LGBTQ inclusive. We know you’ve got good intentions, this is how you can make sure you’re living out those intentions. Get instant access to the checklist when you register a free account.